One of the best ways to maximize your vacation time is to plan a trip over a long weekend. When you have just three or four days away from work it often makes sense to pick a destination close to home. It’s often easier to plan a trip that involves a short flight or a road trip, which will help you to spend less time in transit and more time exploring or relaxing. Never ones to make things easy on ourselves, Adam and I set our sights on Quito, Ecuador for a three-day weekend. This isn’t the first time we have planned an unconventional short trip. In 2013, just one state away from visiting all 50 states, we spent Memorial Day weekend in Anchorage, Alaska. Our trip involved a lengthy outbound journey, a packed weekend of tours and sightseeing, and a red eye flight home. Still, we felt accomplished and even a bit relaxed when the work week started again. Last year we did it all again with a trip to Panama City, Panama, where we spent a full day transiting the three locks of the Panama Canal and a day enjoying the city before a late day flight back home. When we found great flights to Quito, we didn’t hesitate to book them. 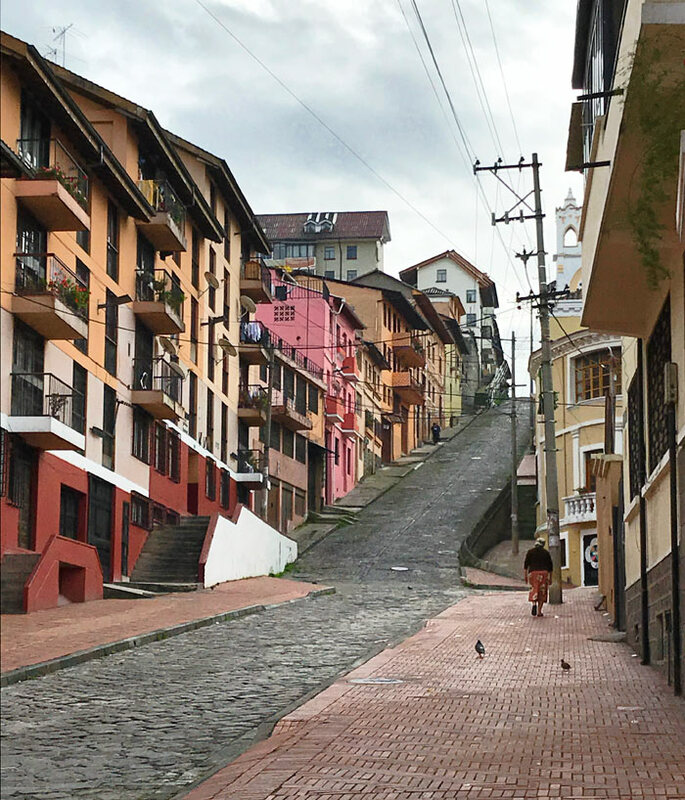 We’re glad we didn’t miss the opportunity; Quito is a beautiful, historic city. With more time we would have loved to explore more of it, but if you have just a day or two (whether in transit to the Galapagos Islands, other South American cities, or for a long weekend like we planned) there is a lot to discover! 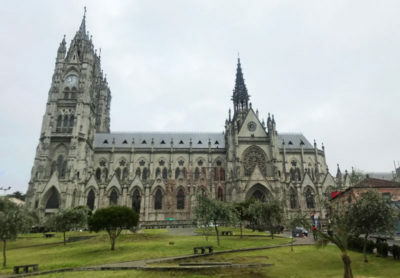 We based ourselves in Quito’s Old Town neighborhood, a UNESCO World Heritage Site, and limited our sightseeing to that area, which is ideal for a short visit. If Quito, Ecuador is in your travel plans, here are some great spots to visit and meals to try! 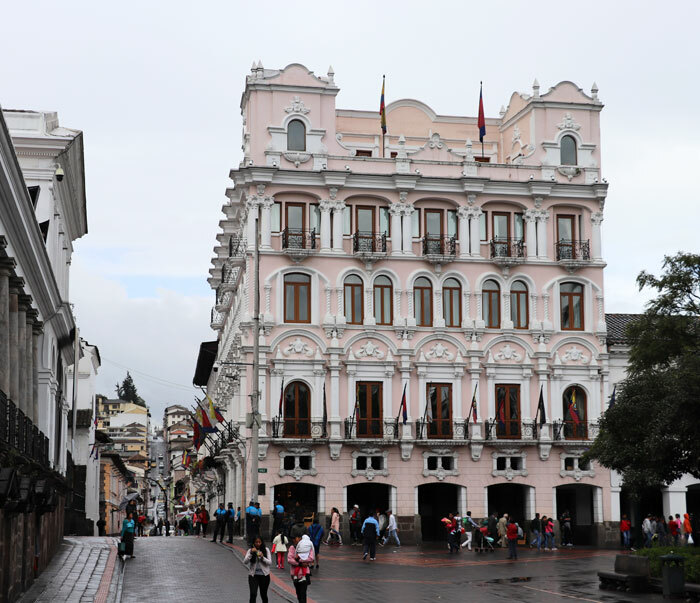 A visit to Quito’s historic old town should start at the center of the action, which is the Plaza de la Independencia. Also known as Plaza Grande, it’s a beautiful area that is often alive with locals and tourists relaxing and passing through. 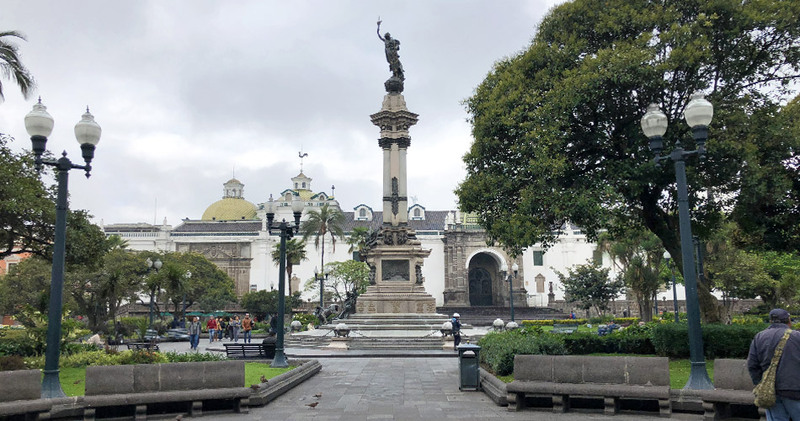 The Plaza de la Independencia dates back to the 1600s, when the area was selected as a central public space and ultimately surrounded by churches, private homes, and municipal buildings. In 1909 the plaza received its most defining feature, the independence monument, which commemorates Ecuador’s independence from Spain. 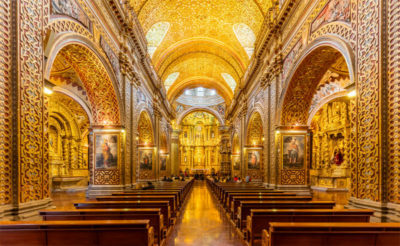 Standing in Plaza de la Independencia will give you a first-row seat to some additional can’t-miss stops in Quito, including the Hotel Plaza Grande (the former Palacio Hidalgo), the presidential palace, and the Cathedral of Quito. The Iglesia de la Compania is one of the most beautiful, impressive churches we have ever seen. Although construction started in 1605, it took more than 150 years before the church was complete. Inside, it glitters under the weight of gold leaf décor that covers the altar and each nave and chamber. A massive organ faces the main alter, where the remains of Ecuador’s patron saint Mariana de Jesús de Paredes are interred. Pictures are not allowed inside the church, which in some ways made our visit more memorable; we put our cameras away and focused on the intricate designs and stunning architecture. 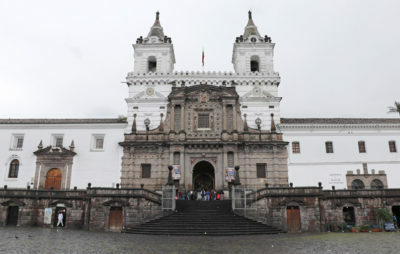 Admission is inexpensive (just a few USD), and it’s a nice introduction to Catholic traditions in Quito. Carondelet Palace is the presidential palace and the seat of Ecuador’s government. 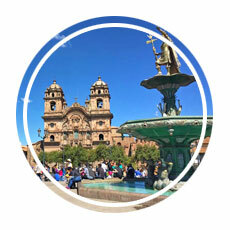 Located on the Plaza de la Independencia, visitors are treated to free guided tours (don’t forget your passport! ), but if you are lucky enough to be there on a Monday morning you will have the chance to experience the Changing of the Guard ceremony that is often attended by the country’s president. The ceremony features a parade and music, and it’s a nice way to experience a strong tradition. 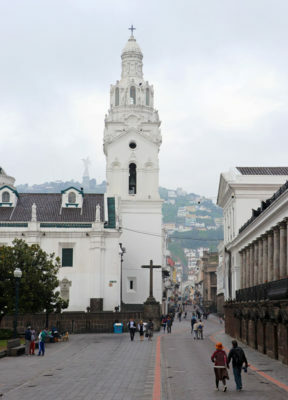 Not far from Iglesia de la Compania is Iglesia y Convento de San Francisco, whose construction began almost simultaneously with the development of Quito itself and ended in 1604. It is the oldest religious complex in Ecuador. The building combines the main church with a convent, which overlooks a central plaza. Significantly, the church houses more than 3,500 religious art works as well as a large library. The church complex is busy during services, but during quiet times you’ll see Franciscan monks moving about as they conduct their business. It is possible to visit the interior of the complex as well. You may not need to visit El Panecillo in order to appreciate its most obvious attraction. Located south of central Quito, El Panecillo is a hill that houses the city’s famous statue of the Woman of the Apocalypse, a Madonna. Made of more than 7,000 pieces of aluminum, the statue can be seen from Plaza de la Independencia on a clear day as well as at night. 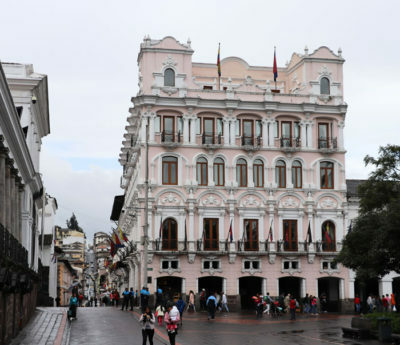 Although it’s a luxury hotel today, the Hotel Plaza Grande is just as famous for being the colonial mansion that belonged to Juan Diaz de Hidalgo, a Spanish conqueror who helped to establish Quito. It’s an expensive but popular option for travelers who love history and want to be very close to the Plaza de la Independencia; the hotel sits right on the corner of the plaza, which makes it quick and easy to visit most tourist spots. Even if you don’t stay there, it’s a beautiful building to see, and a walk through the lobby will connect you with some lovely baroque designs reflective of popular architectural choices during its construction. 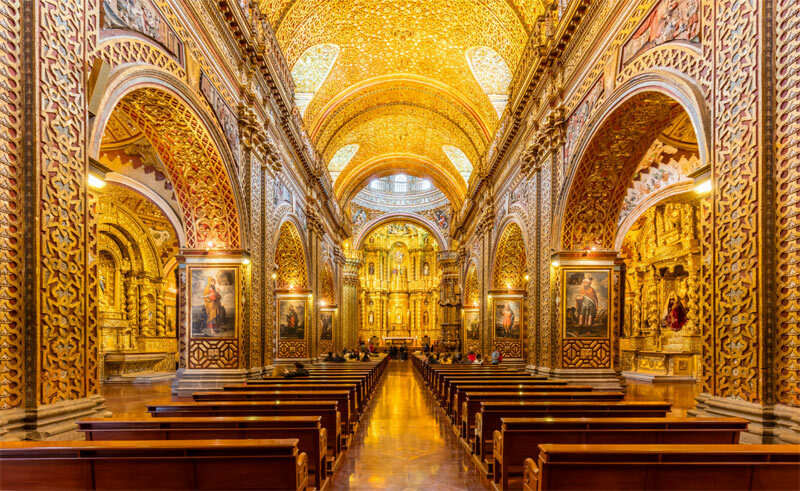 Quito, Ecuador is home to dozens of impressive churches, and La Basilica Del Voto Nacional is another one that deserves a visit. 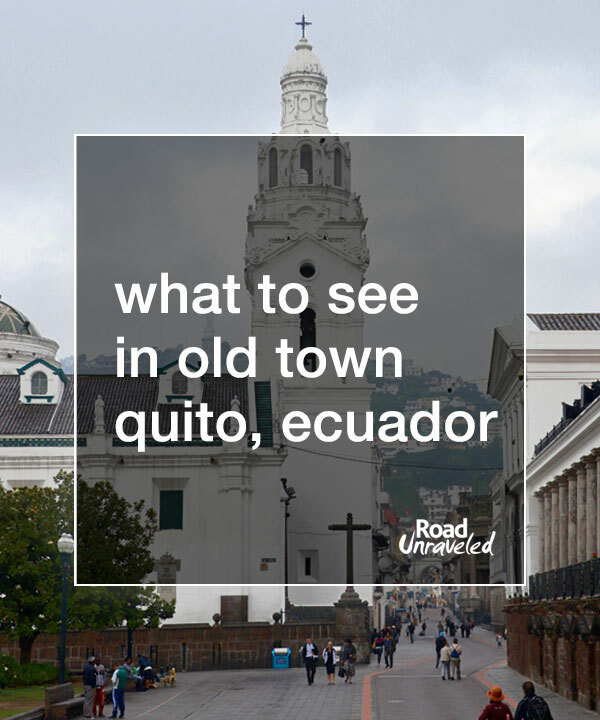 It’s younger by centuries when compared to some of the other recognized churches in the Old Town, but some of the architectural choices are particularly reflective of Ecuador. Specifically, some paintings depict Ecuador’s native wildlife, including turtles from the Galapagos Islands and iguanas. 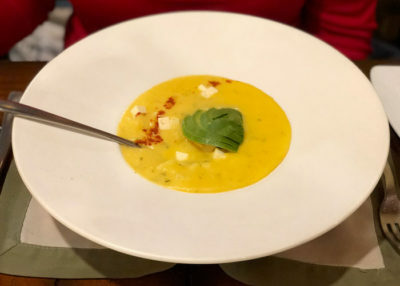 You’ll find plenty of great meals in Old Town Quito, but there are a few dishes that you shouldn’t miss no matter which restaurants you decide to try. Here are some of the food options to look for when you visit Ecuador. We found some of the freshest, tastiest ceviche in Quito, and if you also love fish it’s worthwhile to seek it out. Many restaurants offer ceviche, which may present a single fish or a mix of seafood. If you have a sweet tooth, don’t miss Pacari chocolate. In addition to being sustainably sourced and crafted, it is also delicious and high-quality. We purchased a few varieties made with cherries, Andean blueberries, and even toasted corn while at a grocery store outside of Quito, but you can find it for sale throughout the city. Locro de papa is a rich, creamy potato soup. Served with cubes of local cheese and slices of fresh avocado, it’s an authentic appetizer or a great meal if you are dodging raindrops as we did during our visit. This is one of the most famous foods of Ecuador and it’s a must-try! A type of fried potato-and-cheese patty, llapingachos are sometimes served as a side dish and often eaten as a snack. It’s reminiscent of a latke or potato pancake, and it’s just as delicious. Pork is regularly found on menus in Quito, and carnivores will enjoy it served alongside salad, corn, and fried plantains. It’s popular to serve hornado during celebratory events, but many restaurants offer fried pork or spit-roasted pork as well. Canelazo is an alcoholic beverage, served warm, that combines sugarcane alcohol (aguardiente), sugar, and cinnamon. There are a few variations on canelazo, some of which include fruit juice, but it’s a nice way to warm up on a cold day. After a very long day of sightseeing outside of Quito, Adam and I wandered into Café Plaza Grande because it was just steps from where our tour guide dropped us off. Inside, we feasted on fajitas and ceviche. The fajitas were sizzling and full of flavor, and the ceviche portion was huge and served with some interesting sides including popcorn, corn nuts, and llapingachos. We both loved the locro de papa, which was a perfect way to start our meal. We had a great, relaxing meal, and with its location inside of the Hotel Plaza Grande it’s a convenient spot for lunch or dinner. Located close to the Plaza de la Independencia, we had lunch at Café del Fraile at the insistence of a tour guide who wanted to introduce us to authentic Ecuadorian cuisine. The restaurant clearly caters to tourists, as we were not the only people who were dining with a tour guide, but the food was very good. While Adam opted for empanadas, I selected hornado, a fried pork entrée served with three types of corn, potatoes, and fried plantains. We got more than we could eat for about 18 USD, which was a good deal for lunch and kept us satiated until we left Quito for the airport late that night. Café del Fraile is a nice option for visitors who are looking for Ecuadorian cuisine—but wouldn’t mind reading a menu in English. 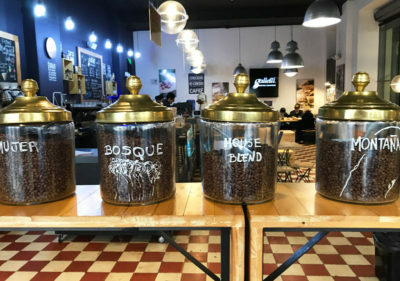 We stopped into Café Galletti for a quick cup of coffee before leaving Quito, and it was a delightful surprise. 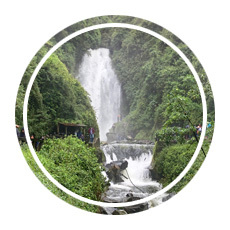 Ecuadorian coffee is rich and delicious, in part because much of it grows in Ecuador’s cloud forests at a high elevation. Café Galletti prides itself on promoting great partnerships with local coffee growers to ensure they enjoy healthy, beneficial working conditions as they harvest high-quality coffee beans. Adam and I both opted for a simple cappuccino while we were there, and it was one of the best we have had anywhere in the world. 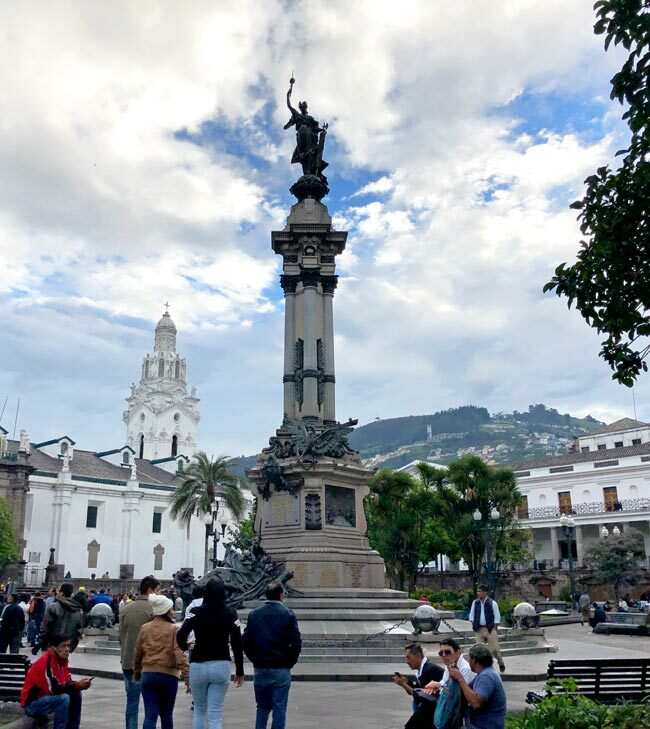 They have a location not far from the Plaza de la Independencia in Quito, so it’s a great stop to rest and regroup during a day of sightseeing. We selected the Hotel Casa Gardenia as our home base while in Quito, and we had one of our best hotel experiences as a result of that choice. Our room was very comfortable; we stayed on the first floor, just around the corner from the reception desk, and although we could hear people as they came and went it was incredibly quiet and easy to sleep well. Breakfast was served each morning, and eggs were made-to-order any way we requested. We also appreciated being just a 10-minute walk from the Plaza de la Independencia, which made it easy to meet our tour groups and wander down the street for a meal. Best of all, though, was the service the Casa Gardenia staff provided to us. From a warm welcome when we arrived to attentive service at breakfast, we had nothing but praise throughout our stay. Still, the most impressive gestures came on our last day in Quito. We checked out of the hotel early in the day with plans to take a full day tour of the Intiñan Museum and Old Town. We asked the staff at the front desk if they could hold our bags for the day, which they happily agreed to do. Our plan was to return to the hotel at the end of the day and take a taxi to the airport a few hours before our midnight flight home. When our tour guide hadn’t picked us up 45 minutes after our confirmed time, they gladly called the company for an update. Hours later, our tour ended earlier than expected, and we decided to spend a few hours at the hotel before leaving for the airport. When we arrived, Enrique told us he held our room all day in case we wanted to sleep, shower, or use the space to repack our luggage in private. We couldn’t believe how kind, generous, and thoughtful that action was, and we were enormously grateful to have the room until we were ready to leave. Enrique and the whole team at Casa Gardenia are wonderful, and we will certainly stay there again in the future. Are you looking for more hotel options for your trip Quito? Here are a few hotel deals to consider. Travelers from the United States will be surprised to find their own currency—the US dollar—is the official currency in Ecuador. You won’t need to visit an ATM or convert money before arriving; the cash you have in your wallet will work just fine. Quito is 9,000 feet (2,800 meters) above sea level, so prepare yourself if altitude sickness could impact how you feel during your trip. 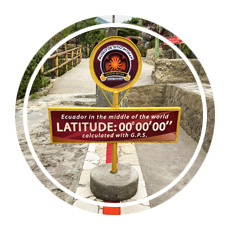 While not everyone suffers from altitude sickness, you may not know how it will affect you until you arrive. Plan to start your visit slowly, stay hydrated, and avoid alcohol. For more tips, check out our article on how to prevent altitude sickness. Quito, Ecuador is a fun, historic city with tons to see and do. Even if you simply concentrate on the Old Town, you will have plenty to experience during a short trip. Leave a comment and let us know if your travels take you to Quito—and please share your own tips and ideas about how to make the most of a quick weekend in Quito! 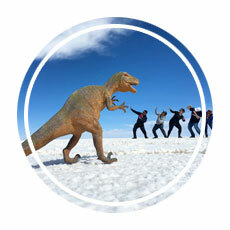 Looking for more interesting places to visit in Ecuador and South America? Here are a few more posts to check out.